The lumberjacks, hillbillies, cowboys, and other frontier folk of the early American West created a fascinating, entirely original world of folklore, inhabited by all manner of extraordinary creatures, Collectively termed Fierce Critters, these included several overtly outrageous examples of the feline variety, as exemplified by the highly suspect but wickedly amusing trio presented here. 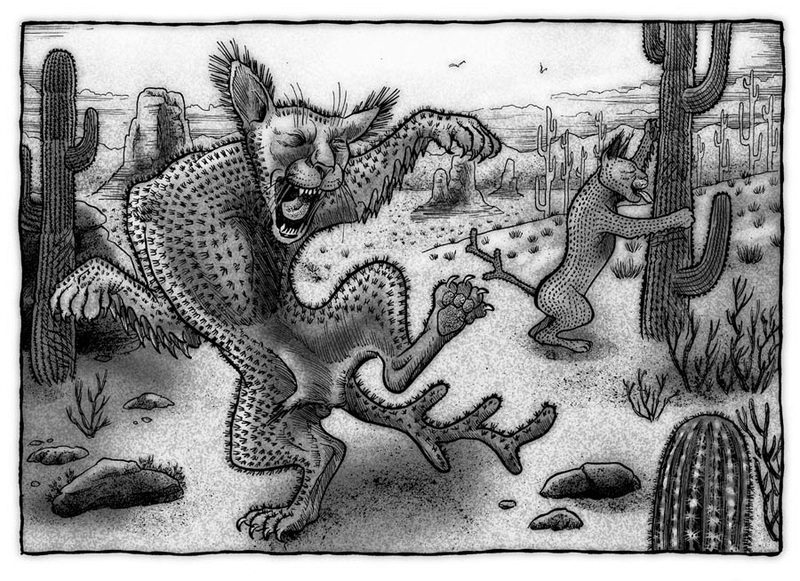 Surely the most memorable of all fictitious felids from the American West is the cactus cat of Arizona, New Mexico, and southern California. On first glance, it simply looks like a rather large but otherwise nondescript black domestic cat, standing about 2 ft at the shoulder and weighing around 30 lb - but look again. Then you will see that its ebony fur is strangely thorny or spiky, especially at the tips of its ears and tail, and also upon its brows. You will also observe that its long tail is branched at the end - but, most striking of all, you will perceive a thin blade of razor-sharp bone running along the edge of each of its two front legs. These blades serve a very important function. 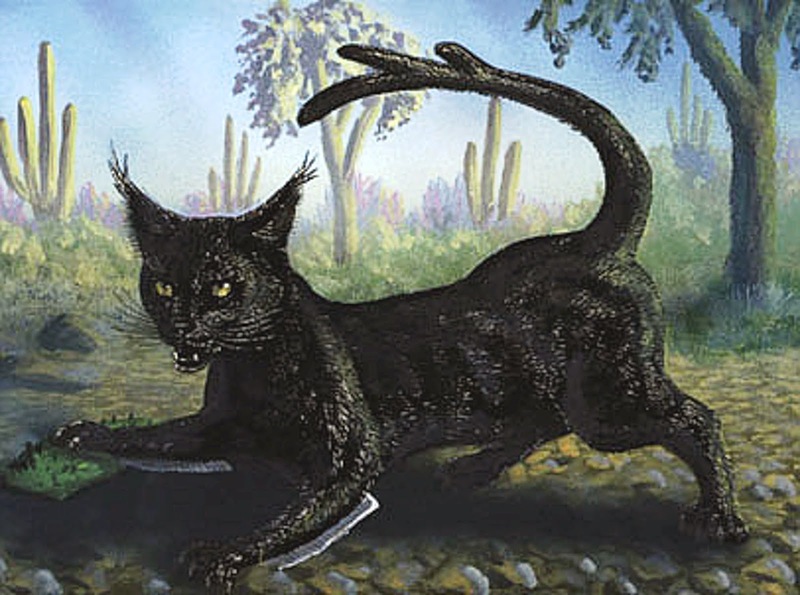 The cactus cat earns its name from its passion for imbibing the sap of cacti, which it obtains by slashing their bases with its front legs' bony blades. Swiftly the sap begins to flow, but the cactus cat refrains from drinking this liquid until it has fermented into a potently alcoholic brew - whereupon it laps up the liquor in an unbridled fervour. Inevitably, this demented felid becomes ever more intoxicated, until, when finally satiated, it staggers away, screeching and caterwauling uproariously in unabashed, drunken delight, very ready and only too willing to thrash unmercifully with its spiny, lashing tail anything, or anyone, approaching too closely - as many a cowboy, albeit while in a similar state of intoxication himself, has frequently testified. 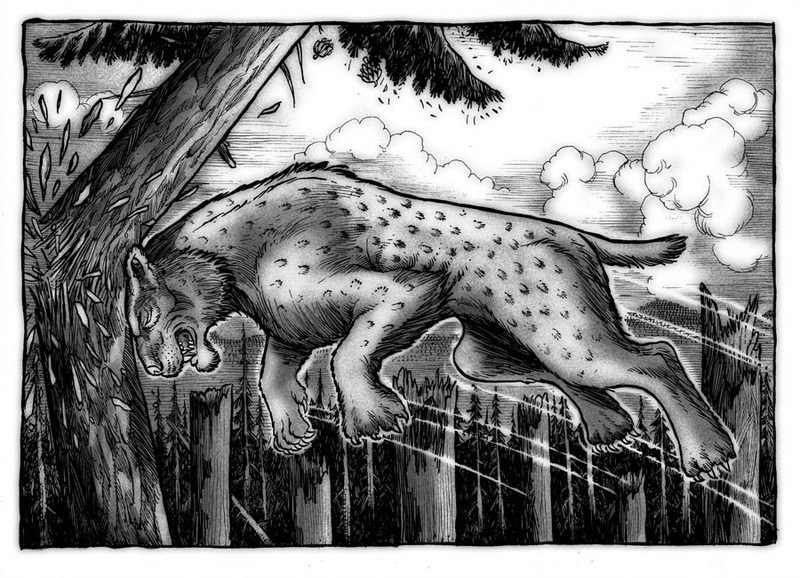 THE SPLINTER CAT – A FELINE BATTERING RAM, OR A MIAOWING RHINO! The splinter cat must surely be evolution's answer in feline form to the rhinoceros. Feeding upon wild bees and raccoons, the splinter cat has developed a particularly violent means of flushing them out of their arboreal hideaway. Like an animated battering ram, it charges head-first into a likely-looking tree, crashing its specially-reinforced forehead against the trunk with a thunderous collision. Not surprisingly, any raccoons or bees residing in the tree's branches flee in terror - right into the splinter cat's waiting jaws. Rather more subtle, but no less successful, than that of the splinter cat is the ploy adopted by the sliver cat. Its prey is somewhat larger than the splinter cat's, for it is inordinately fond of lumberjacks. So much so, in fact, that it will spend many hours patiently lying in wait for one to pass by under the branch of a pine tree on which it is lying concealed. And as soon as one does, the splinter cat smiles sweetly at him - before deftly rapping the hapless tree-feller on top of his head with the smooth side of the hard mace-like knob borne at the tip of its tail. 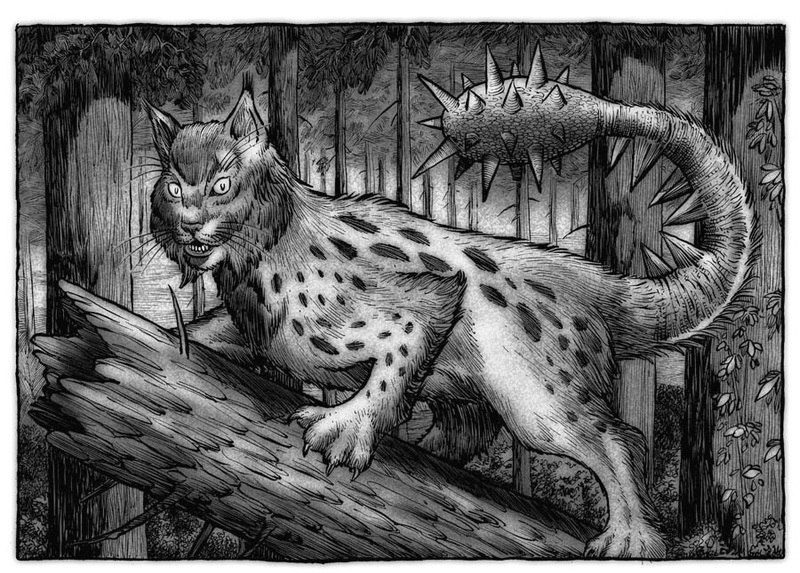 The other side of this mace is spiked, for good reason - because as soon as it has concussed its victim, the splinter cat uses the spiky side of its mace to hook into the lumberjack's clothing, before hauling his inert body up into the tree, for a close encounter of the fatal kind! 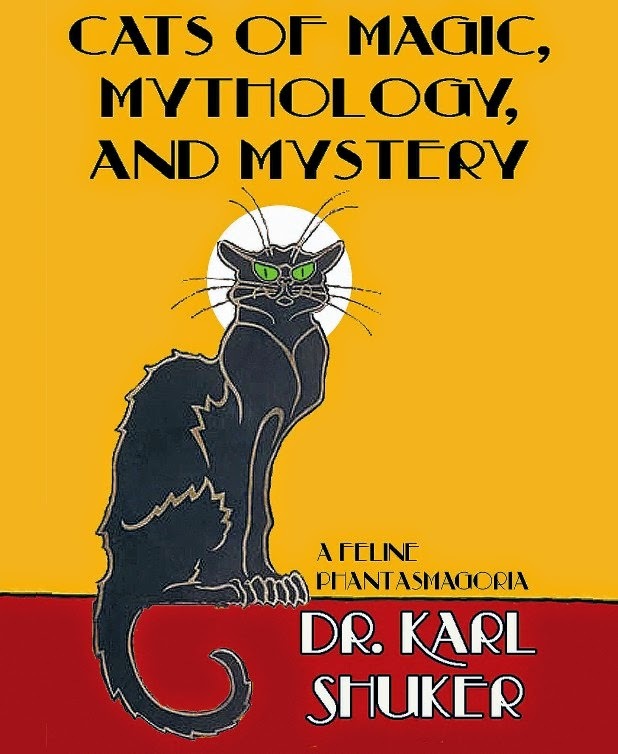 Further details concerning these and other fabulous felids from North American folklore can be found in my book Cats of Magic, Mythology, and Mystery (2012). With an area of more than 340,000 square miles, New Guinea is second only to Greenland as the largest island in the world (Australia is bigger than both but is officially deemed an island continent, rather than a mere island). 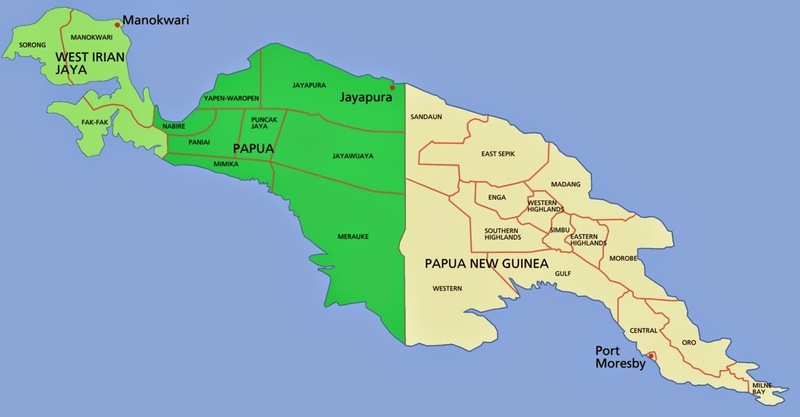 It is divided politically into Irian Jaya or Indonesian New Guinea as its western half (and which itself is divided into two separate Indonesian provinces – Papua, and West Papua, the latter also being called West Irian Jaya) and the independent country of Papua New Guinea (PNG) as its eastern half. Throughout this mega-island's length and breadth, however, are dense and often little-explored rainforests where various surprising new species of animal have been revealed in recent years, including a black-and-white panda-like whistling tree kangaroo known as the dingiso Dendrolagus mbaiso (see my book The Encyclopaedia of New and Rediscovered Animals for full details) - and also where several more may still await discovery, judging from reports on file of certain bizarre beasts that cannot be satisfactorily reconciled by science with any species known to exist here. 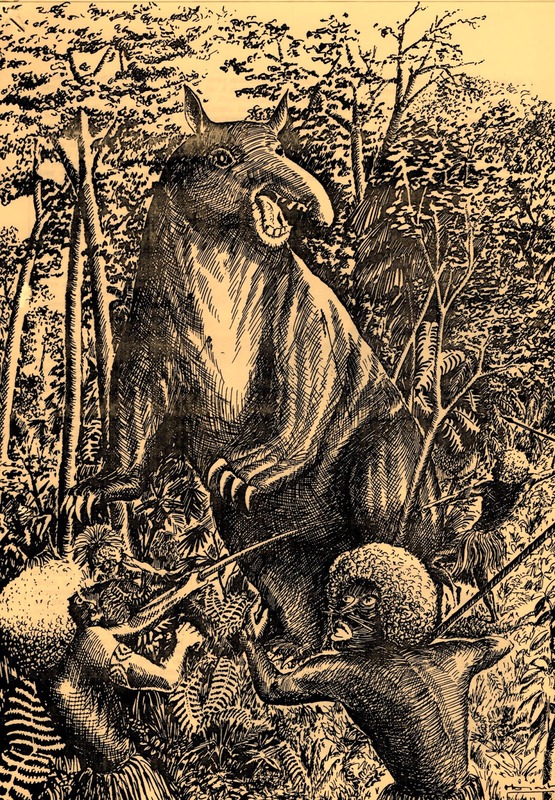 The history of what must surely be among the most intriguing of these varied New Guinea cryptids began in a distinctly prosaic, unromantic manner - the finding of an unexpected pile of dung. In 1875, the eminent English scientific journal Nature carried a couple of letters from Alfred O. Walker concerning the recent discovery by Lieutenant Sidney Smith and Captain Moresby from H.M.S. Basilisk of a startlingly large heap of fresh dung in a forest while surveying on PNG's north coast, between Huon Bay and Cape Basilisk. Indeed, the pile of excrement in question was so big and its overall appearance was such that the men assumed it to have been left by some form of rhinoceros. Yet there is no known species of rhino native to New Guinea. 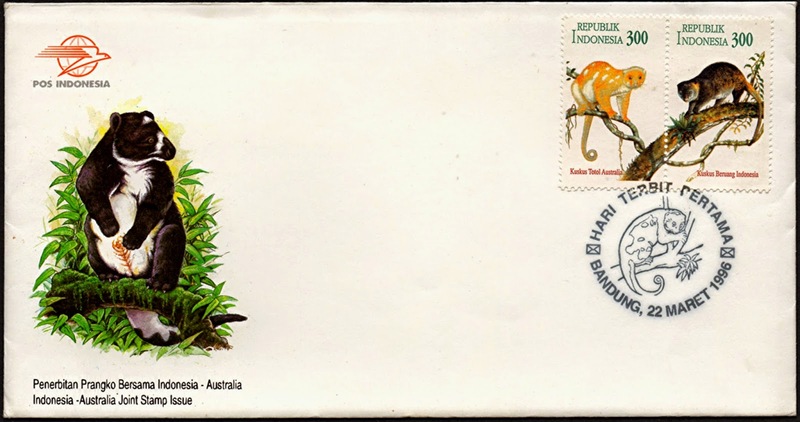 The mystery deepened via a further Nature letter of 1875, submitted this time by German zoologist Dr Adolf Meyer, who confirmed that the Papuans inhabiting the south coast of the Geelvinks Bay knew of a rare but very large pig-like creature in the area. And in 1906, two such beasts were finally encountered, albeit in a wholly unplanned manner. During the spring of that year, explorer Captain Charles A.W. 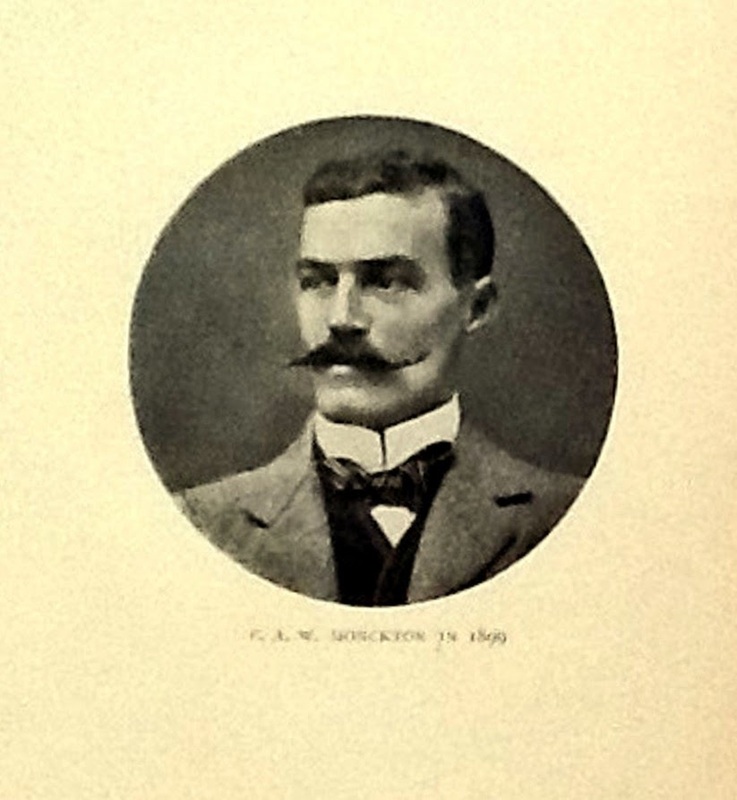 Monckton was leading a major expedition to PNG's Mount Albert Edward. On May 10, two of his team's members, an army private called Ogi and a village constable called Oina, were sent on ahead to investigate a track discovered by the expedition the previous day. Somehow the two men became separated, and while seeking Oina, Ogi came upon two extraordinary creatures grazing nearby. Although vaguely pig-like, each of these animals was approximately 3.5 ft tall, and 5 ft long, with a very dark, patterned hide, cloven feet, a long snout, and a horse-like (hairy?) tail. Ogi was so frightened by these weird creatures, which he referred to as devil-pigs as he felt sure that they must be demons in porcine guise, that he tried to shoot one, but missed. What happened after that is unclear, because when he was later found by Oina and taken back to camp, Ogi was in a severe state of shock, and unable to recollect anything further. Intriguingly, Ogi's testimony gained partial support from expedition leader Captain Monckton himself, because he affirmed that some very large cloven-footed tracks had indeed been found on Mount Albert Edward. And a mysterious, unidentified long-snouted beast had also been sighted during an expedition to Mount Scratchley. 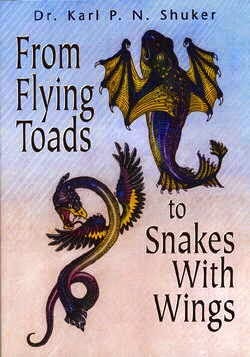 There is even native testimony of such a creature from Irian Jaya, gathered in 1910 by Walter Goodfellow in the vicinity of the Mimiko River during an expedition launched by the British Ornithologists Union, and which was the inspiration for a hilariously over-blown and exceedingly exaggerated account published later that same year in an American newspaper, the Stevens Point, Wisconsin, Gazette. Most tantalising of all, however, is a series of stone carvings collected from 1962 onwards in the Ambun Valley of PNG's highlands-situated Enga Province, and only a few millennia old at most. 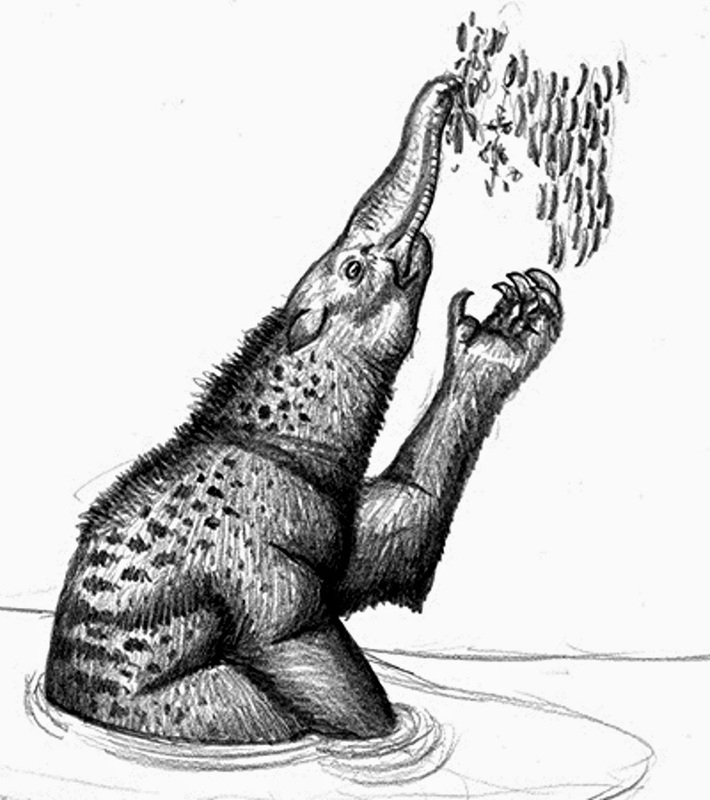 They depict a very odd-looking mammal with a rotund body, forelimbs and hindlimbs clasping its belly, a well-demarcated neck, narrow head, large eyes and ears, and a notable trunk-like snout curving downwards and bearing a pair of flaring nostrils at its tip. 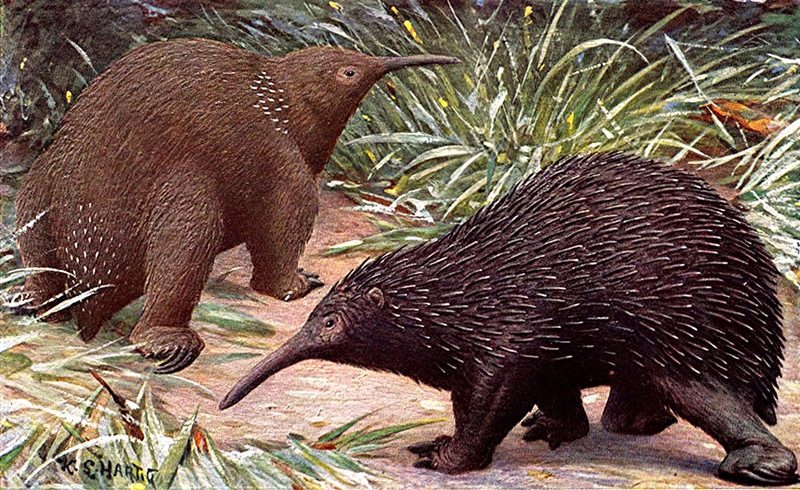 Traditionally, this animal has been identified as a New Guinea long-beaked echidna (spiny anteater) Zaglossus sp., even though the resemblance is superficial at best, as the carved beast lacks spines and its bulky trunk with well-defined nostrils is very different from the echidna's slender tubicolous beak and ill-defined nostrils. Further discrepancies from the carved beast are the echidna's tiny eyes and ears, globular head, and almost non-existent neck. In 1987, however, mammalogist James I. Menzies proposed a much more dramatic, yet morphologically more compatible, identity. 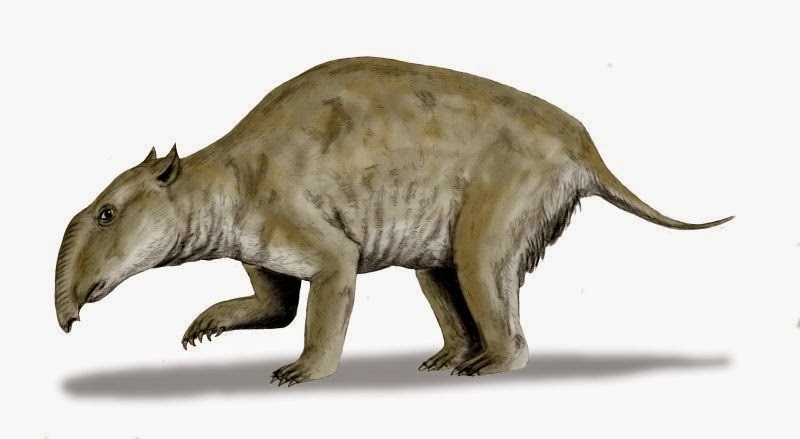 He claimed that the Ambun beast was a palorchestid diprotodont - a large and very bizarre-looking herbivorous marsupial, which did indeed have big eyes, a short trunk, well-delineated external ears, and other features displayed by the carvings. Moreover, palorchestids would have looked very like giant pigs or even tapirs in life, and certainly startling enough if encountered unexpectedly to conjure up notions of pig demons or devil-pigs in the minds of frightened locals. The only problem with this persuasive identity is that palorchestids are known from fossil remains only in Australia (none are presently on record from New Guinea), where they became extinct around 13,000 years ago - or did they? 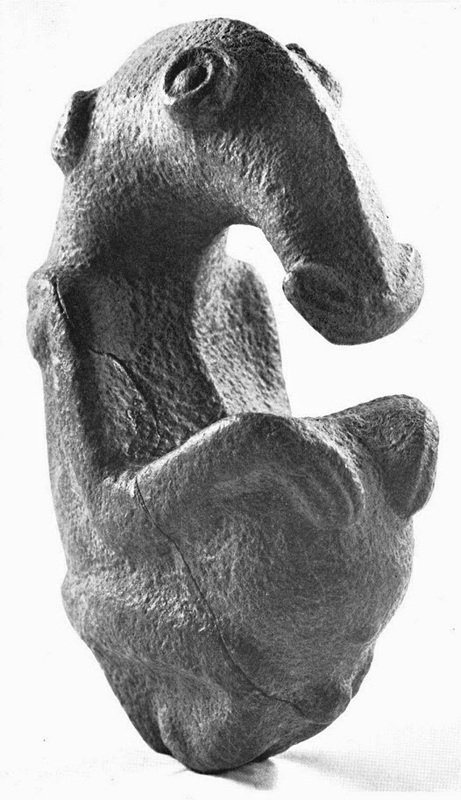 The resemblance between cryptic devil-pig, palaeontological palorchestid, and carved Ambun beast is sufficiently telling to support the exciting possibility that in New Guinea's near-impenetrable, sparsely-explored jungle heartlands, some of these amazing animals still exist, albeit currently unrepresented by uncovered fossils and rarely seen in the living state, with only their tracks - and the odd dung-heap - to betray their presence. According to Graves, the gazeka had been discovered by an explorer accompanied on his travels by a case of whiskey, and who thought he may have seen it once before, in some form of dream. 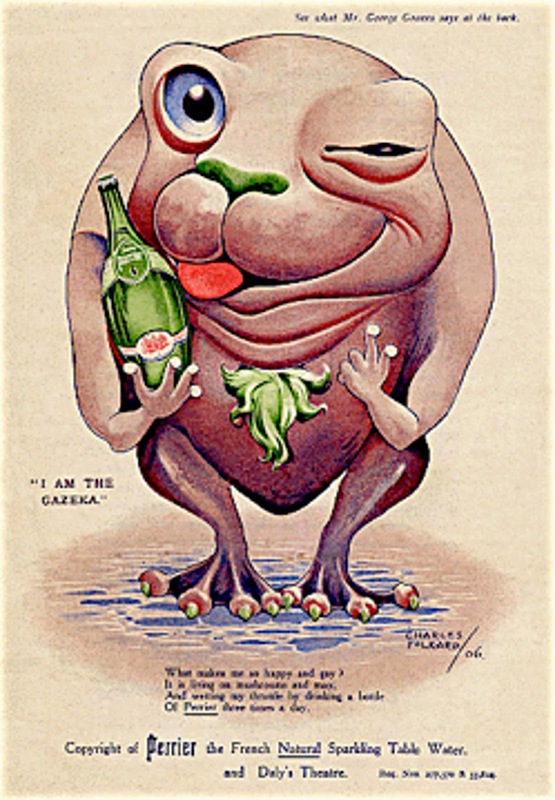 Clearly, therefore, whoever shortly afterwards dubbed the Papuan devil-pig 'Monckton's gazeka' was utilising Graves's then-famous creature creation to make a sly, topical dig at Monckton's expense, implying that he had dreamt up the devil-pig, possibly while under the influence of alcohol! 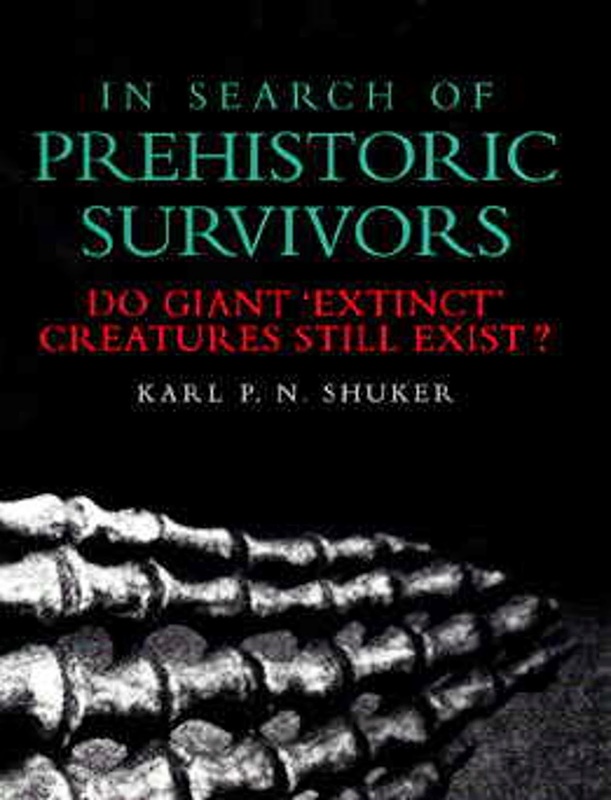 Further information concerning the Papuan devil-pig can be found in my book In Search of Prehistoric Survivors. On 23 August 2014 at 10 pm Pacific Time in the USA and on 24 August 2014 at 6 am in the UK, I shall be appearing on Coast To Coast AM's radio show in an hour-long interview, talking about giant spiders of the cryptozoological kind. 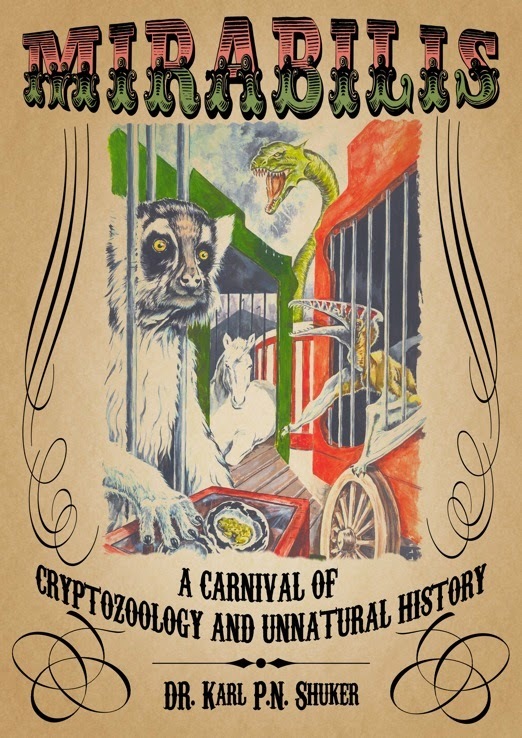 The interview follows on from my recent, very popular ShukerNature blog post on this same subject (click here), which in turn was excerpted from the extensive chapter devoted to such creatures that appeared in my book Mirabilis: A Carnival of Cryptozoology and Unnatural History (Anomalist Books: New York, 2013), and which is the most comprehensive account of giant crypto-spiders ever compiled and published. Now, as a foretaste of my upcoming radio interview, here is a further excerpt from that same chapter in Mirabilis – but if you're an averred arachnophobe, this may be a good time to turn away and read something else instead! What must surely be the most bizarre of all giant spider reports featured a veritable siren, albeit one with eight legs instead of a fishtail, yet equally as gifted musically (not to mention homicidally) as any of Greek mythology's lethal mermaids. The earliest documentation of it that I have so far uncovered is a detailed account in the Ann Arbor Argus newspaper for 14 September 1894, which was subsequently reiterated in various other American newspapers. According to this extraordinary journalistic concoction of Grand Guignol and cryptozoology, during late March (and invariably at night) each year for many years, men and women had inexplicably been disappearing in a region of Paris known as the Tomb of Issoire, without any trace of them ever being discovered. One night, however, a policeman in this vicinity happened to hear a strange musical song issuing forth from a hole at the base of a huge rock there, dubbed the Giant's Cave due to the legend that a giant had been buried there long ago. As the policeman stood listening, he saw a young man approach the hole, seemingly hypnotised by the unearthly strains issuing forth from their hidden subterranean source, and then suddenly the man raced into the hole at full speed. The policeman chased after him, firing his revolver to alert some of his colleagues for back-up as he entered the hole. They soon arrived, by which time the strange music had ceased, its mysterious melody having been replaced by the sounds of a violent struggle. Arming themselves with ropes, ladders, and lamps, the policeman's colleagues swiftly penetrated the chasm into which the hole led, and beheld a terrifying sight. "...as large as a full grown terrier, covered with wartlike protuberances and bristling with coarse brownish hair. Eight jointed legs, terminated by formidable claws, were buried in the body of the unfortunate victim. The face had already disappeared. Nothing could be seen but the top of the head, and the monster was now engaged in tearing and sucking the blood from his throat." Several blasts from the policemen's guns soon dispatched this horrific creature, after which they found their colleague lying in a corner, unconscious but unharmed. They then carried the two men and the carcase of the great spider back out through the hole into the Parisian street where this surreal incident had begun. "The dead body of the spider was conveyed to the Museum of Natural History, where it was carefully prepared and stuffed and is now on exhibition. – Once a Week." The museum was presumably France's National Museum of Natural History, in Paris, but it will come as no surprise to discover that the museum has no record of ever even receiving, let alone exhibiting, such a singular specimen. Nor is there any such species as Arachne gigans, living or extinct. 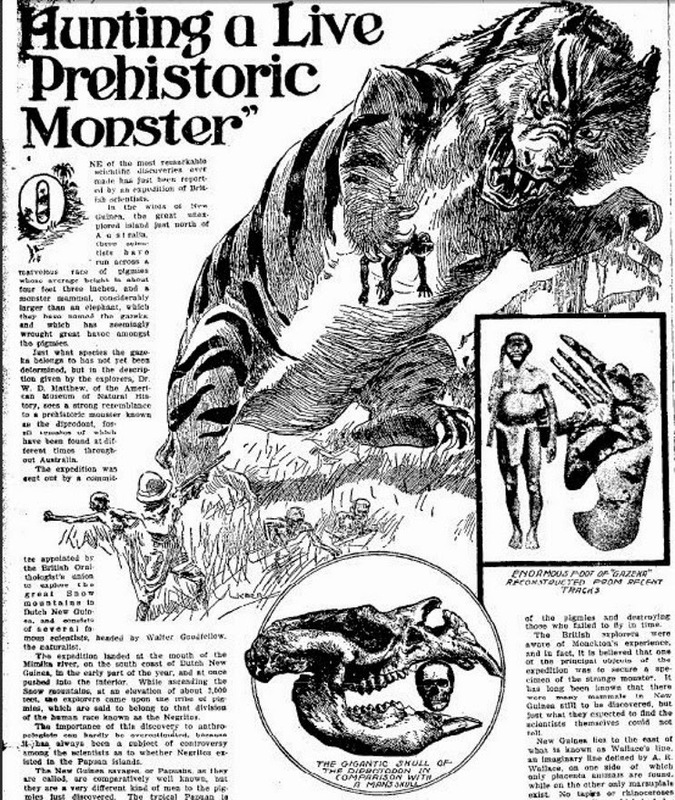 During the late 19th Century and early 20th Century, it was commonplace for newspaper editors to spice up their publications with lurid tales of extraordinary discoveries and events that had no basis in reality. 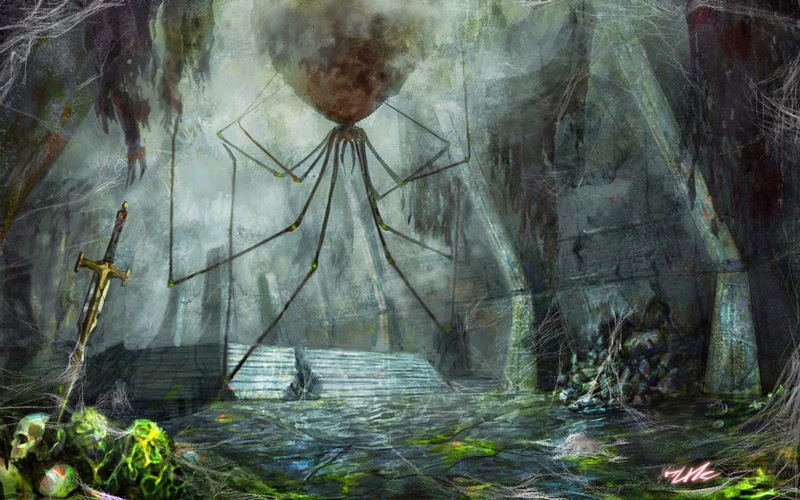 And certainly, there seems very little doubt that the giant singing spider of Issoire only ever existed within the fevered imagination of an editor anxious to fill up some spare column inches inside his newspaper. 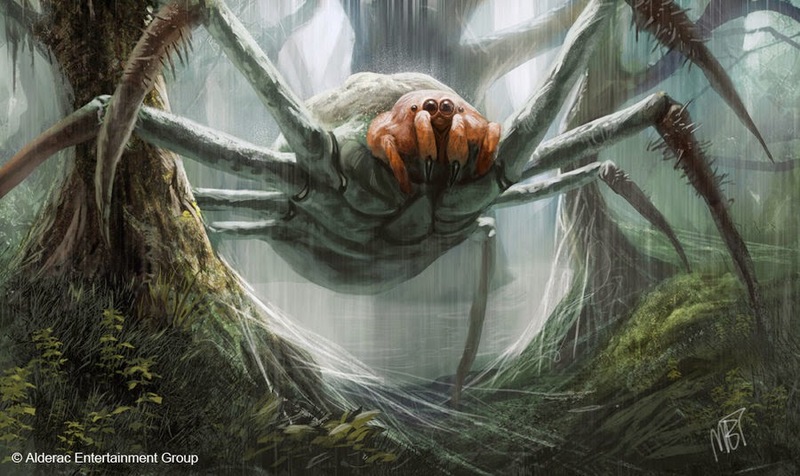 Be sure to check out the entire chapter on giant spiders in my book Mirabilis: A Carnival of Cryptozoology and Unnatural History (2013), and I hope that you will be able to listen to my Coast To Coast AM interview on this bloodcurdling subject during the coming weekend. 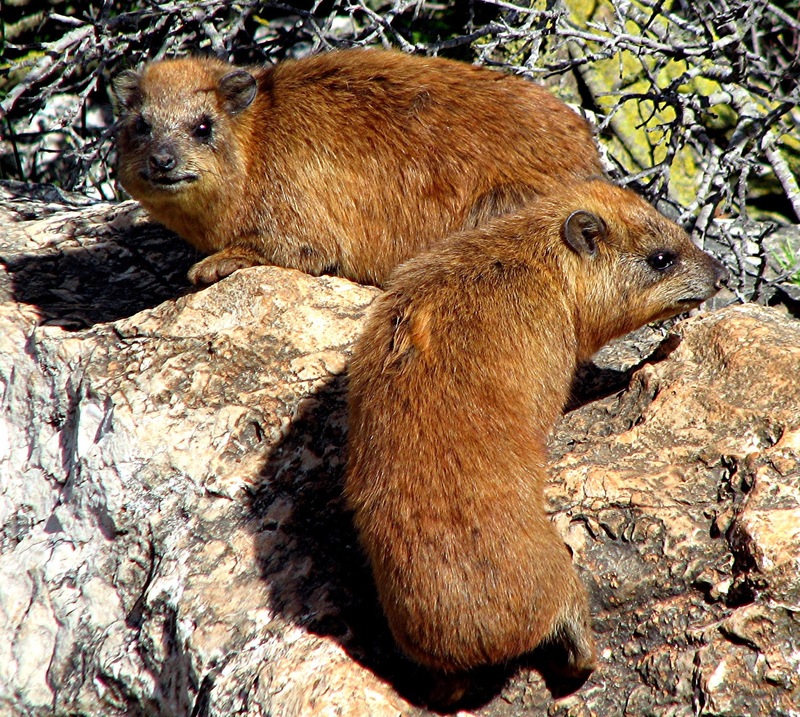 THE DAS-ADDER – A HYRAX-HEADED HYPNOTIST? 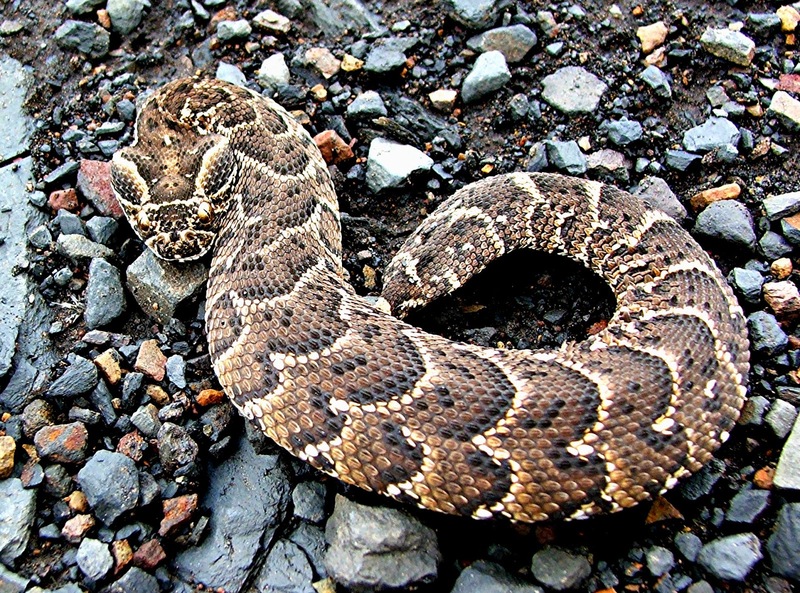 South Africa's Drakensberg Range is supposedly home to a remarkable creature known locally as the das-adder, which has been reported for well over a century here. 'Dassie' is an alternative name for a hyrax – those small, rabbit-like hoofed mammals whose closest living relatives are the elephants. The das-adder derives its name from its head, which allegedly resembles that of a dassie, and its sinuous body, reminiscent of an African puff adder's. Many native people sharing its provenance claim that this curious mystery beast is extremely venomous and even capable of hypnotising its victims with a single stare. In 1940, W.L. 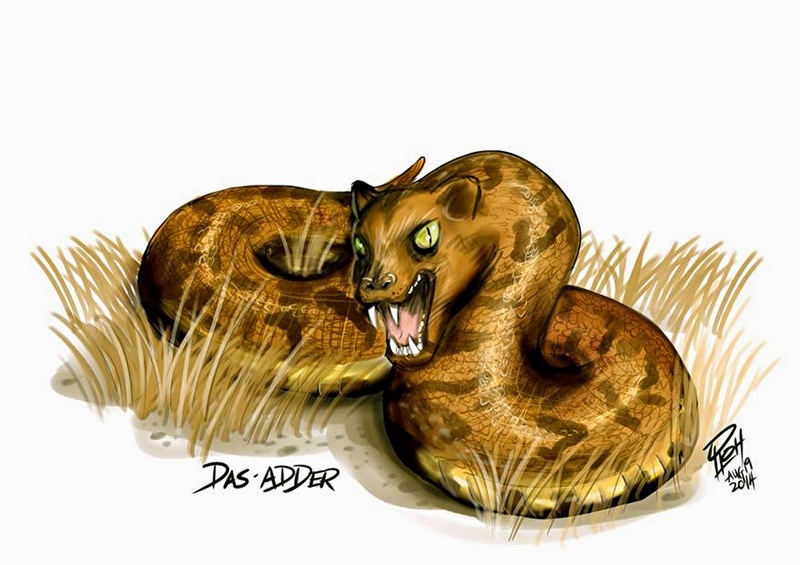 Speight published a lengthy article on African mystery beasts in the journal Empire Review, and included a detailed account of the das-adder. Speight stated that its tail was marked with yellow and red stripes, its external ear openings were folded into a crest, and in the opinion of some authorities this cryptid was not a snake at all, but rather a large lizard, with a 2-ft-long tail. One of those authorities was 19th-Century zoologist Dr Andrew Smith of the Cape Town Museum, who was so intrigued by stories of the das-adder that he even advertised for a specimen to be brought to him for examination, but his advert did not elicit any specimens. In his view, this elusive beast was probably based upon nothing more dramatic than poor observation of the Cape rock monitor Varanus albigularis, slipping half-hidden between rocks and boulders so that its limbs were concealed from view. 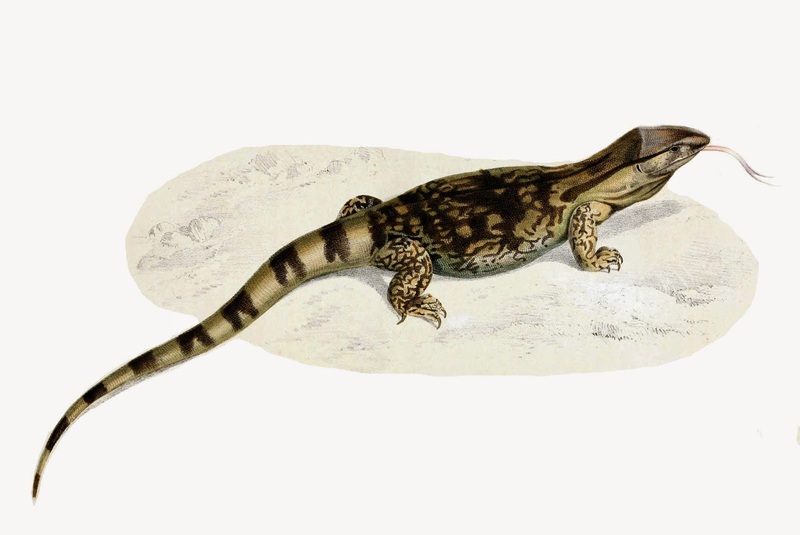 An entertaining idea, but as this varanid does not have a red and yellow tail or a hyrax-comparable head, it leaves rather a lot to be desired as a convincing identity for the das-adder - which, sadly, seems today to have become virtually forgotten, even among cryptozoologists, with its status still unresolved. The article reproduced below in this present ShukerNature post was the first one of mine to be published in Strange Magazine, way back in November 1991. 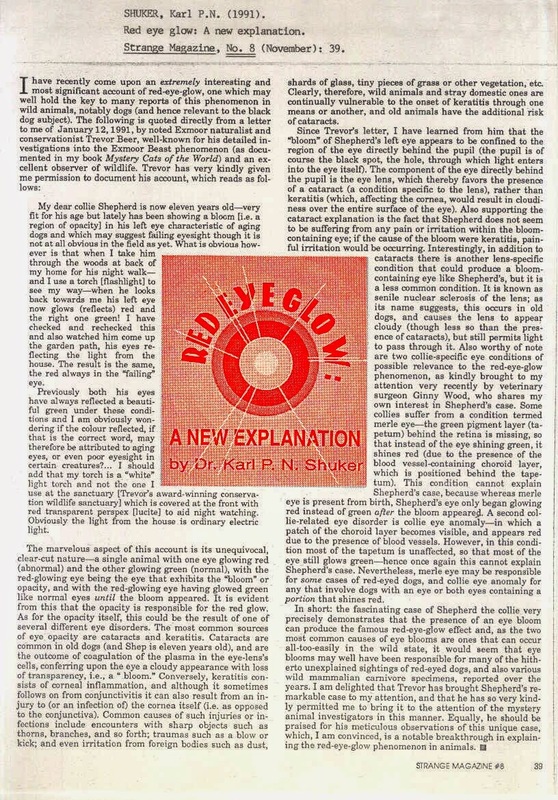 Its subject is a fascinating case of red eye-glow whose very singular nature provides a truly unique insight into this anomalous phenomenon – one that has been reported both with tangible, corporeal creatures of cryptozoology and with zooform entities of a seemingly supernatural, paranormal nature. They may look very different from us, but a wide range of other animals outwardly express grief and react to death, especially with regard to relatives or longstanding companions, in ways that are extraordinarily - even, on occasion, eerily - similar to our own responses. It should come as no surprise that our nearest relatives, the apes and monkeys, experience grief when confronted with the death of a close relative, but what is startling is just how profound such sorrow can sometimes be. Dr Jane Goodall recorded one harrowingly moving case during her classic researches into the behaviour of wild chimpanzees. In 1972, while Goodall was studying a community of common chimpanzees Pan troglodytes in Tanzania's Gombe National Park, its matriarch, an elderly female called Flo, died. Flo had been in the company of her 8½-year-old son, Flint, who, unlike most adult chimps, had always remained with his mother rather than becoming independent. Flint initially appeared bemused by her death, sitting alongside her throughout that first day, sometimes inspecting her body, grooming her, and even pulling her hand towards him, hoping that she would groom him in return. When evening came, he constructed a small nest for himself in a tree. Here he passed the night - the very first that he had ever spent alone. Although distracted for a time the next day by his brother's chimp group, it was not long before Flint had returned to the place where Flo had died, and just sat there, staring. Later, he climbed a tree to visit a large nest where he and Flo had slept a week earlier, then he climbed down again, and continued staring. As the days passed, it was evident that Flint was sinking ever further into a state of deep depression, showing no interest in anything or any other chimp in his community, and not eating, just lying huddled on the ground. His eyes had sunk back into their sockets, and when he did move it was as if he had prematurely aged, shambling like an old chimp. Three weeks after Flo's death, Flint returned once more to the place where she had died, and lay down there, staring out vacantly. Shortly afterwards, he died - of grief, in Goodall's opinion. And certainly, in view of how very closely Flint's behaviour had mirrored the grieving of a bereaved human, it would be difficult indeed to draw any other conclusion. 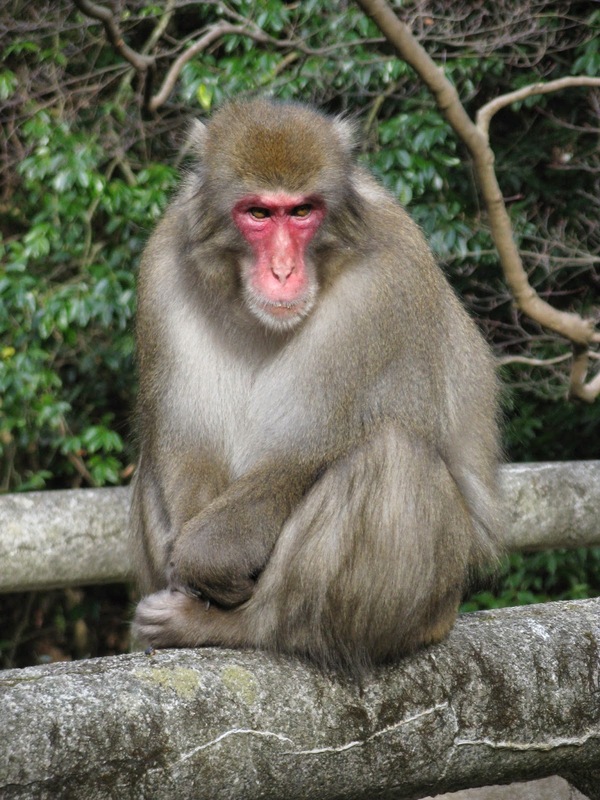 Similarly, while television wildlife producer George Page was filming a group of Japanese macaques Macaca fuscata for a TV documentary, one of the macaques gave birth to a stillborn infant. Instead of abandoning it, however, its mother carried its body everywhere with her. And each night, after climbing one specific tree with it in her arms, she would give voice to a series of heart-rending screams. Not until three full days and nights of what can only be described as mourning had passed did she finally place her baby's body on the ground and leave it. Grief and mourning are not confined to primates either. While studying baboons in Kenya, Michigan University behaviourist Dr Barbara Smuts once witnessed four baboons chasing an infant impala Aepyceros melampus. Despite its mother's attempts to protect it, one of the baboons succeeded in seizing the baby antelope, killing it, and eating it in front of its mother. After the baboons left, she remained there, staring down motionless at her calf's devoured remains. And when Smuts revisited the site several hours later, the female impala was still there, and was still gazing fixedly at her dead calf. Moreover, exactly the same scene met Smuts's eyes when she returned there the next morning. 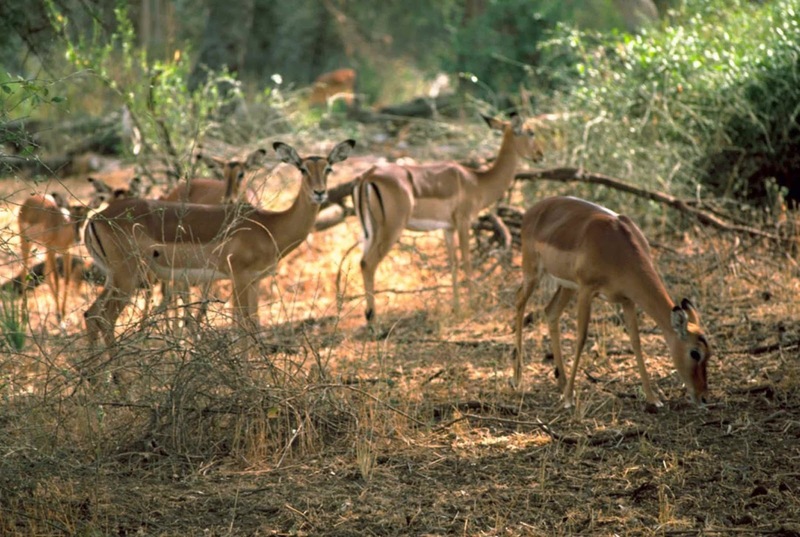 It was as if the mother impala had been turned to stone, or had been physically rooted to the spot where her offspring had been so brutally killed. Later that day, she finally departed, but - whether through shock, genuine grief, or both - for over a day she had ignored the world and all of its dangers that she would normally have been so intent upon monitoring, to pay silent homage to her dead calf. "A greylag goose that has lost its partner shows all the symptoms that John Bowlby has described in young human children in his famous book Infant Grief. The eyes sink deep into their sockets, and the individual has an overall drooping experience, literally letting the head hang." Indeed, with swans it is not unknown, if one member of a longstanding pair should die, for the surviving member to stop eating and die within a short time afterwards. 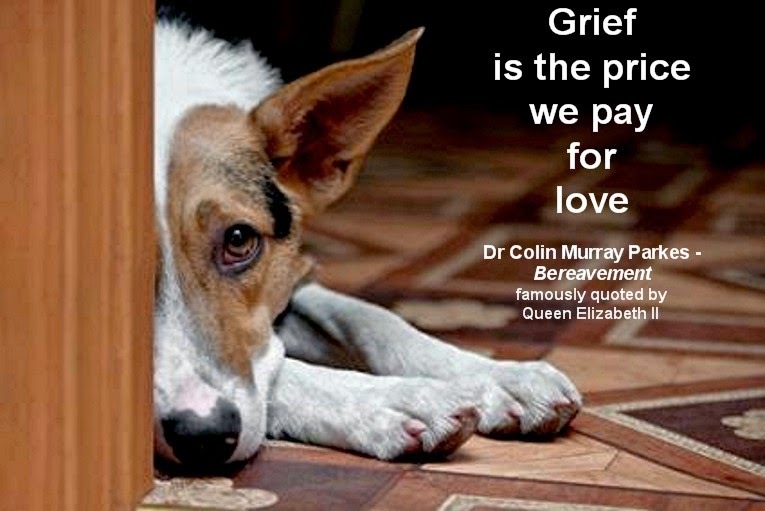 The grief experienced by pet dogs, cats, and other higher species following their owner's death is often plain for all to see. Moreover, emotional responses have also been documented with animals confronted by the death of an unrelated but familiar animal companion. In the 1960s, animal rescuers Ken and Mary Jones of Cornwall received a young seal for care, one of many coated with oil spilling forth at that time from the beached oil tanker Torrey Canyon. Naming him Simon, they nursed him back to health at their wildlife sanctuary, and while he was there they received another young seal, this time a female, dubbed Sally, who had been blinded by the oil. Simon and Sally soon became firm friends, and Simon patiently acted as Sally's eyes. Sadly, however, a year later Simon fell ill, and despite the Jones' best efforts to save him, he died. Sally was very distraught at the loss of Simon, lying next to his body and refusing to move from the spot, even after his body had been taken away. Sally rejected all enticements by the Joneses to eat, and in under a week she too had died - not from physical illness, however, but wholly from grief. The same tragic fate almost befell an elderly female donkey named Julie. 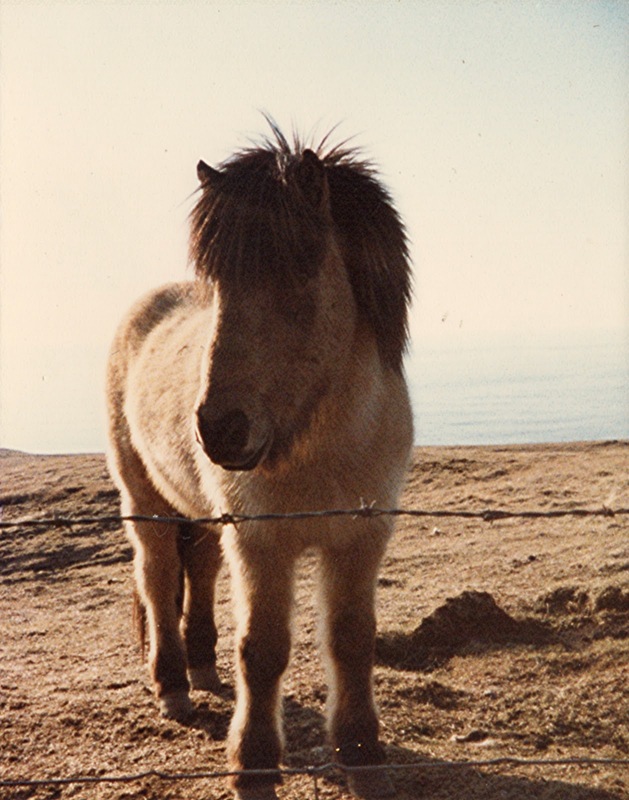 As recalled by zoologist Dr Maurice Burton in Just Like an Animal (1978), Julie had spent many years in the company of Leonardo, an old Icelandic pony. Finally, however, the day arrived when Leonardo was so ill that the only option for his owners was to have him put to sleep. So Julie was taken into a field some distance away from the shed where she and Leonardo lived together, while Leonardo was euthanased in the shed. When his body had been removed, Julie was released, but despite her own advanced years she galloped straight across the field to the shed where she had last seen Leonardo. After standing inside for a short time, looking down at the spot where he had been lying, Julie came out of the shed again, raised her muzzle skywards, and gave voice to an unearthly, agonised scream, unlike anything normally emitted by donkeys. After that, she stopped eating, and seemed destined to join Leonardo in death before long - until fate intervened, in the form of a Shetland pony, introduced as a companion on the suggestion of one of her owners' friends. Julie and the pony became good friends, her appetite returned, and several years later the two could still be seen together. No less moving is the reverent loyalty and apparent recognition shown by elephants to the mortal remains of other elephants, especially dead relatives, while totally ignoring the bones of other animals. Amboseli-based elephant researcher Cynthia Moss has revealed that an elephant herd will make a considerable detour from their normal route to investigate unearthed elephant skeletons, and will gently run their trunks along the contours of these bones (particularly the skulls and tusks), fondle them, smell them, and even carry them away for quite a distance before finally dropping them again. One seven-year-old elephant in a herd came upon the jaw of his dead mother, brought by Moss into the research camp at Amboseli in the hope of uncovering its age. Long after the others in his herd had moved on, this elephant remained there, touching and turning over his mother's jaw with his trunk and feet. Did he recognise it as his mother's, from its shape or even its scent, perhaps? And if so, what were the thoughts passing through his mind? DO ANIMALS CRY EMOTIONAL TEARS? Elephants that have been separated from relatives weep copious tears from their temporal glands when reunited. Moreover, these sizeable mammals weep 'true' tears too, i.e. secreted from their lachrymal glands. Such tears are normally for lubrication purposes - but they are also allegedly wept at times of grief or fear. Young elephants orphaned when their mothers were killed by poachers for their tusks are known to wake screaming in the night, their eyes full of tears. 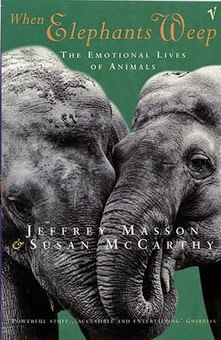 And in their compelling book When Elephants Weep (1994), animal behaviourists Dr Jeffrey Masson and Susan McCarthy include several reports of captive elephants seen weeping when ill-treated by their human masters. Equally, when researching for their book Crying, the Mystery of Tears (1985), Minnesota-based biochemist Dr William Frey and Muriel Langseth received many letters from dog owners claiming that their pets had wept emotional tears. 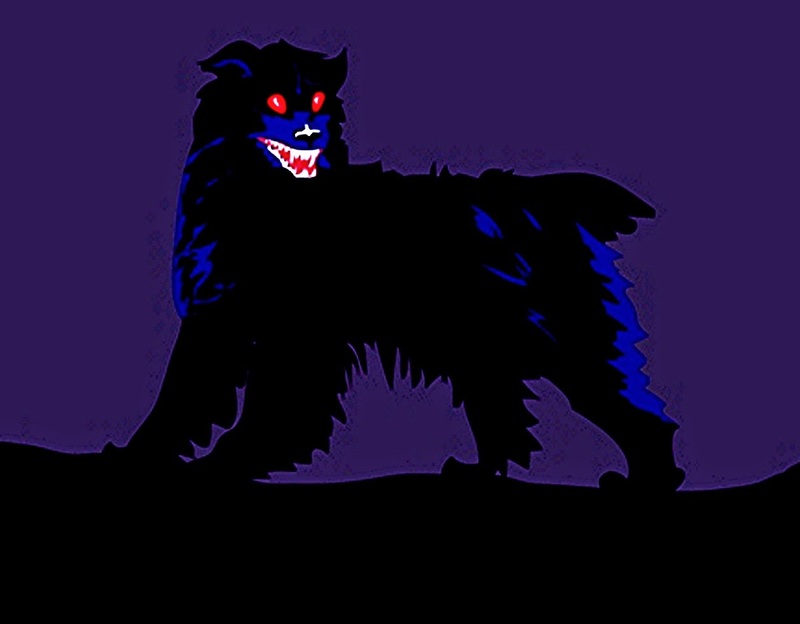 Among the more thought-provoking examples are: an Irish setter that cried when the family cat died; a Boston terrier that hid under the table and sobbed tears whenever his owner scolded him; several reports of weeping Mexican hairless dogs (this breed is apparently famous among devotees for crying if upset); and, most compelling of all, a pomeranian who, when confined in the bathroom by his owner's mother while looking after him, lay on the floor "...with his head resting on his paws and big tears were rolling down his face. His whole body was shaking as he sobbed; the sounds were coming from deep within". ARE ANIMAL FUNERALS AND BURIALS MORE THAN A LEGEND? Traditional folklore throughout the world tells of animals attending funerals for members of their own kind, and also burying their dead. However, some wildlife observers claim that such events sometimes occur in real life too. Elephants are well known for standing around a dead member of their herd in solemn, almost ritualistic manner, noticeably with their heads pointing away from the body, and adult females have sometimes been witnessed placing leaves or branches over the body of a dead calf. 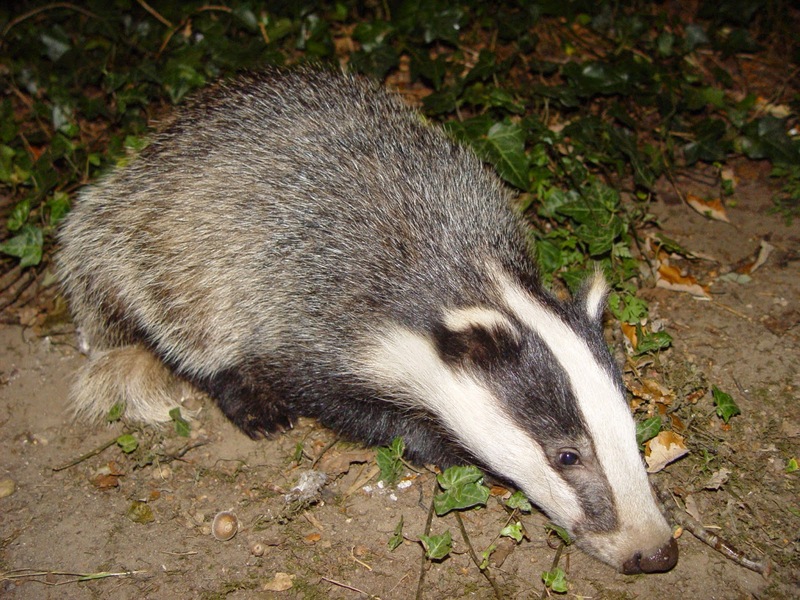 Badgers are said to bury their dead, and naturalist Brian Vesey-Fitzgerald reported how an adult female European badger Meles meles, after emitting a macabre scream at her sett's entrance, had been seen to dig a large hole nearby and then, assisted by an adult male badger, proceed to pull the dead body of another male out of her sett, deposit it in the freshly-dug hole, and cover it with soil, after which the two went off on their separate ways. Sceptics suggest that badgers are merely caching corpses to be eaten later. In February 1996, however, a Daily Telegraph reader from Guildford reported discovering the dead body of one of his pet rabbits inside a tunnel that had been specifically closed-off by his other rabbits within the tunnel system in which they all lived. Yet rabbits don't eat each other! Most bizarre of all are the various reports on file of alleged bee mourners. These are honeybee swarms that have mysteriously appeared at the funeral of their beekeeper. A recent case featured Shropshire beekeeper Margaret Bell, who died in June 1994. Although she lived in Ludlow, Mrs Bell kept her bees 11 km away in Leintwardine. Nevertheless, shortly after her funeral in Ludlow, a huge swarm of bees suddenly appeared and settled on the corner of the street directly opposite her house, staying there for roughly an hour before flying away again. Just an odd coincidence, or were these insects truly Mrs Bell's bees that had somehow found their way from Leintwardine to pay their last respects to their keeper? 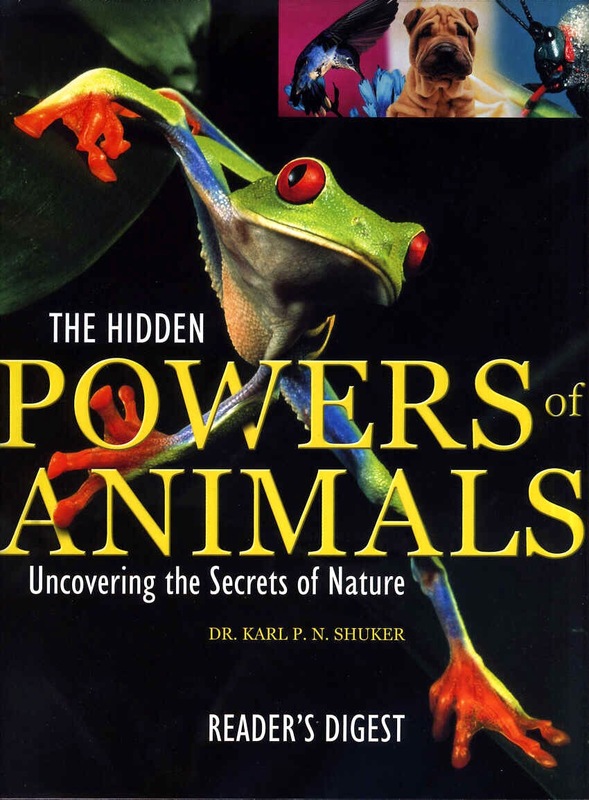 This ShukerNature article is excerpted from my book The Hidden Powers of Animals: Uncovering the Secrets of Nature.